In Bomaderry on the South Coast of NSW a small group of volunteers are pioneering an urban expression of mercy services. During 2008 the team, operating from a local community hall, began to provide a weekly free meal. “The Main Course Cafe”, contrary to expectations most of the clientele were not financially destitute, but somehow socially isolated. Many of the people who come week after week find in the main course cafe their only real opportunity to relate to other people in a non-judgmental, accepting environment. People have become socially isolated for a variety of reasons including age, divorce, intellectual or psychological difficulties, substance abuse and other addictions. In The Main Course Cafe people have found acceptance in a non-threatening environment. Several now see themselves as part of the team, helping with the meals and with the organisation. Some have demonstrated growing self-esteem and an ability to relate openly to other people and to accept other peoples differences. One woman who was separated from her husband and family had been coming to The Main Course Cafe, These meals were meeting her need for companionship and acceptance in a non-judgmental environment. Last December she confided to one of the team, as if it was a secret, that she didn?t come for the meal, she came for the company. One of the men who is part of the The Main Course Cafe has had a hard life. When he started coming to the main course cafe he was withdrawn and almost morose. He would come every week and sit, looking glum, speaking only if he was spoken to. Following a hospitalisation event people from the main course cafe helped him with housework and supported him in his recovery. The affirmation he received from the others at The Main Course Cafe when he showed us some knee rugs that he had crocheted, combined with the experience of being cared for during his convalescence have helped to change his whole manner. He is now friendly and sociable and looking for opportunities to serve. 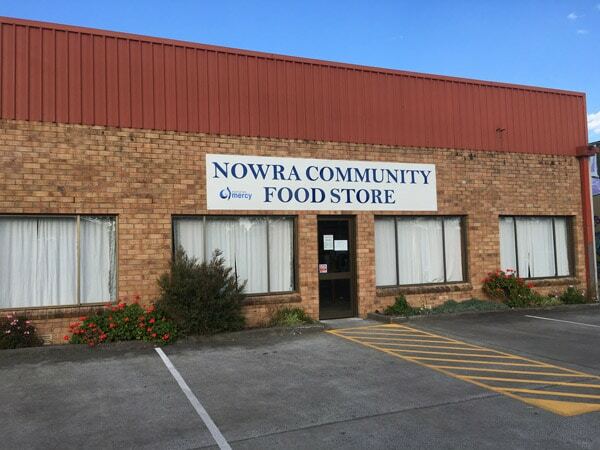 We provide free meals from the ‘Main Course Cafe’ and cheap groceries from the ‘Bomaderry Community Store’. Our facility is simply known as ‘NO. 6′. Gradually as committed volunteers offer to help, we are expanding our services to both the local community and also inviting the local community to be involved in supporting others who are in greater need overseas. The centre at NO 6 is the meeting place for many lonely, marginalised and otherwise needy people because they have come to know that they will find unconditional love and acceptance there. We also have a project to supply restored pushbikes and wheelchairs as well as sewing garments and stuffed toys for South Sudan, also we knit and crochet rugs and garments in order to send to Romania. A large new prison has recently opened nearby and we’ve teamed up with prison fellowship to support inmates and their families. We provide the place for prison fellowship meetings. Even though we’ve tried to ‘fly below the radar’, our community involvement has gained the attention of several service organisations as well as a local club who have all pitched in and supported us financially which has in turn given us greater opportunity to serve the people of our region and beyond. What commenced as humble beginnings in serving a free meal on Friday nights as the expression of a missional undertaking over 12 weeks while we studied the book of Acts early in 2007, has grown to become a significant service to the community.